This is a step-by-step guide to implementing audit journal monitoring within QMessage Monitor. 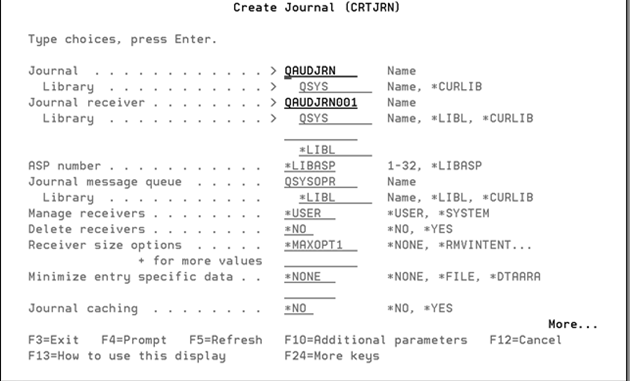 This feature allows you to monitor the QAUDJRN security journal in real time. When you configure the monitor to monitor the message queue MMAUDJRN in the QMessage Monitor installed library, it creates the MMAUDJRN queue automatically; however, system auditing needs to be set up manually, if required. The entries are turned into messages that can be seen in the message file MMAUDJRN. 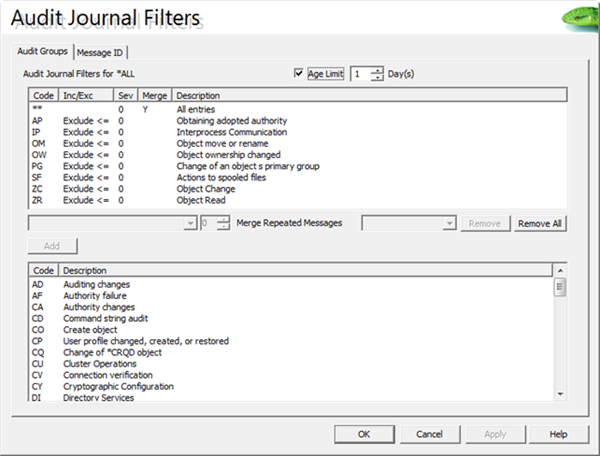 The command MMAJFMNT can be used to set up filters to limit the number of audit journal entries converted. 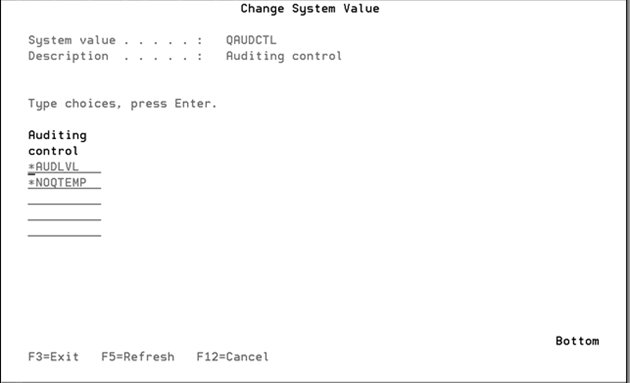 We now have to set up the audit control by amending the value in system value QAUDCTL. This system value contains the on and off switches for object and user-level auditing. Review the System Value QUADLVL section below for further information. We have now started auditing for all possible options on the system. We now have to set up QMessage Monitor to receive the updates. As the system can generate a large number of entries during certain operations, the MMAJFMNT program allows you to specify an initial filter. 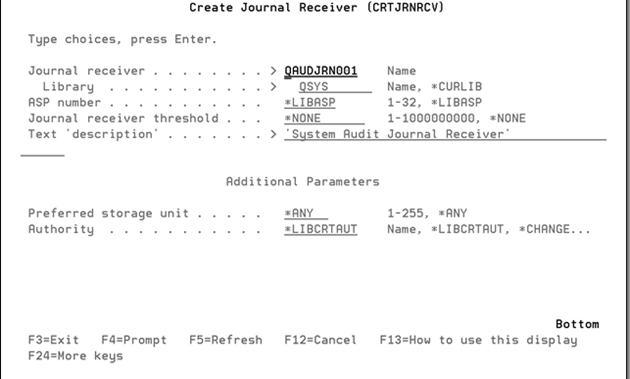 You can limit the types of records that are converted using this program. You can enter a combination of an E to exclude journal entries, or an I to include entries, together with the severity field that's used to select record types within the class. 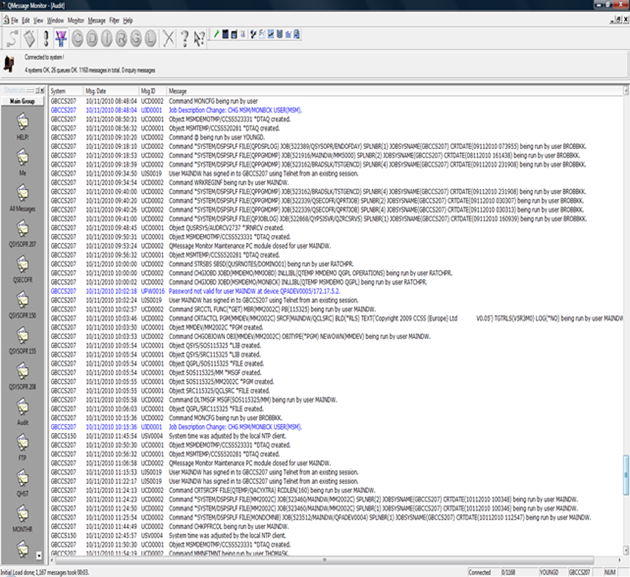 Audit records are converted to messages, which can be seen in the message file MMAUDJRN. Use the WRKMSGF to look at the messages and their severities. For an Include Record, records are selected if their severity is greater than or equal to the entered value. For an Exclude Record, records are excluded if their severity is less than the entered value. In the following example, a default filter for all systems has been created. The top section shows a number of excluded codes and the bottom section lists all the included codes. Additional detailed filters can be applied at a Message ID level (second tab), and also at a system level. If you configure the MMAUDJRN message queue in the QMessage Monitor installed library, then the monitor will convert entries from the audit journal to messages in this queue. You can use the MMAJFMNT command to set up an initial filter (as previously mentioned) to reduce the number of entries converted; otherwise the number of messages generated can be very great. 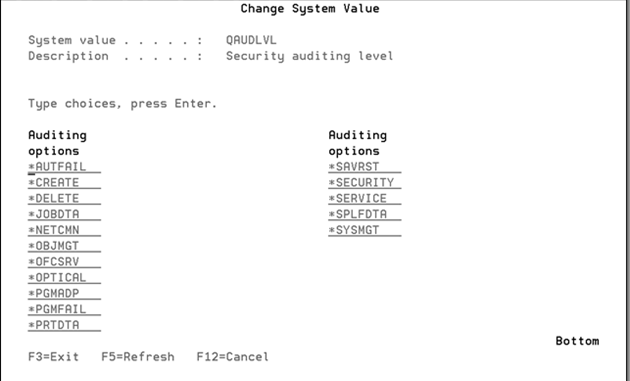 This is a list of the security auditing level options for the system value QAUDLVL. They're described in detail in the following sections. QAUDLVL - Controls the level of action auditing on the system. If the QAUDLVL system value contains the value *AUDLVL2, then the values in the QAUDLVL2 system value will also be used. If the QAUDLVL system value does not contain the value *AUDLVL2, then the values in the QAUDLVL2 system value will be ignored. You must have *AUDIT special authority to change this system value. A change to this system value takes effect immediately for all jobs running on the system. The shipped value is *NONE. The auditing options are described in the following sections. No security action auditing will occur on the system. This is the shipped value. 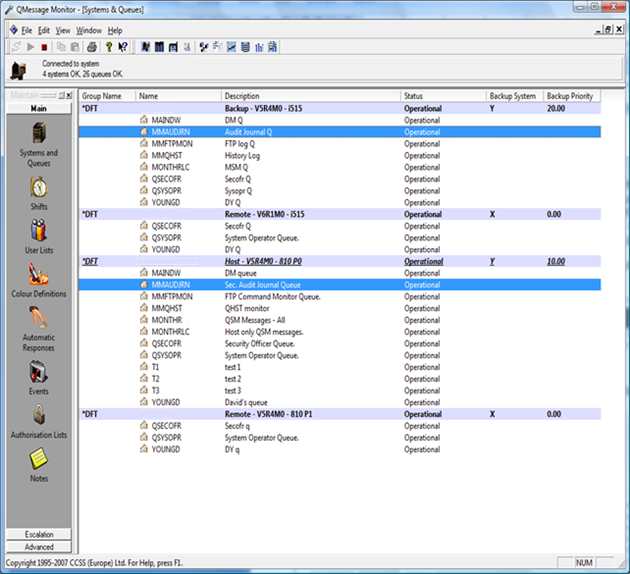 Both QAUDLVL and QAUDLVL2 system values will be used to determine the security actions to be audited. If you wish to use the QAUDLVL2 system value exclusively, set the QAUDLVL system value to *AUDLVL2 and add your auditing values to the QAUDLVL2 system value. If you wish to use both system values, set your values in the QAUDLVL system value along with the *AUDLVL2 value, then add any additional values to the QAUDLVL2 system value. All object creations are audited. The following are some examples. Note: Objects created in library QTEMP are not audited. All deletions of external objects on the system are audited. Note: Objects deleted from library QTEMP are not audited. Adopting authority from a program owner is audited. When the password for the service tools security officer user ID is requested to be defaulted. All security-related functions are audited. Note: *SECURITY is composed of several values to allow you to better customize your auditing. If you specify all of the values, you will get the same auditing as if you specified *SECURITY. The following values make up *SECURITY. For a list of all the service commands and API calls that are audited, see the OS/400 Security Reference publication.